Bring a unique flair to your winterwear the help from our custom logo wet dye ladies scarf. This stylish and eye-catching 36" x 36" product can be imprinted with your company name, logo and much more for further brand awareness. 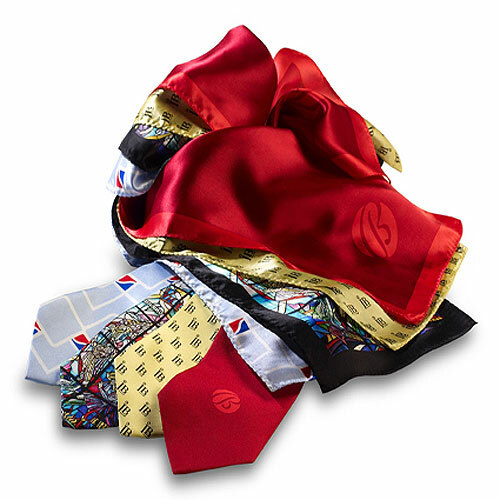 Perfect for uniforms, trade shows, clubs or special events, this scarf is produced with high-quality polyester using the wet-dye process. There is a 50 piece minimum on orders, making this a great item for trade shows. Let our award-winning design team make a product perfect for you! 36" x 36" scarf custom designed. Complimentary artwork up to 8 colors, pre-production sample and set-up included. 50 piece minimum. Quantity discounts available.